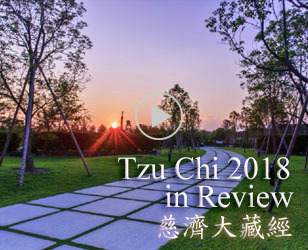 In 2003, Tzu Chi International Humanitarian Aid Association (TIHAA) was formed out of the compassion of Dharma Master Cheng Yen in view of the massive destruction to the earth by human beings, which causes many natural disasters. Millions of people have suffered and massive natural resources are lost. Master Cheng Yen instructed his disciples to research and develop products which can be used in international relief missions. TIHAA is organized into different functional groups, each in charge of food, clothing, housing, transportation, information and communication, and a think tank, who contribute through their respective profession and expertise in research and developing food, clothing, transportation method, information and communication. 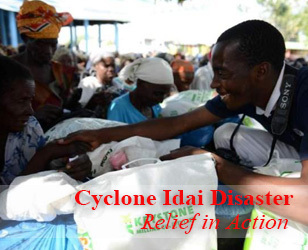 They not only have to be able to mobilize immediately to provide logistic support for volunteers carrying out relief work in the disaster area, they must also take into consideration of the disaster area’s likely shortage of water and electricity. TIHAA first took part in international disaster relief work in the 2004 South Asia tsunami. Transporting logistic supply to the disaster area included tents, blankets, rice, large water filters, rice cakes and soya brown rice. In view that the victims are hungry and thirsty, porridge, vacuum packed rice (cooked) and biscuits are first provided as this food is convenient, easy to swallow, nutritious and filling. When the environment has improved and everything has settled down more, foods like the instant noodles we developed will be provided. The flavors of the foods are also well considered to suite the local residents’ diet. For example, for Indonesians who prefer spicy foods, a curry flavor product was developed. During the process of R&D of these foods, the poor hygiene condition of the disaster area is also taken into account. Hsieh Ching-Kui Said that once the victims’ living condition are back to normal, and they are able to cook for themselves, Tzu Chi will continue to provide food supplies through large scale relief distributions, giving needed resources like rice, cooking oil .etc. These urgently needed items can not afford any delays during their transportation. Tzu Chi volunteer Li Ding Ming said that air freights are used during the first 48 hours after the disaster. Other supplies like medicine, blankets and tents may use air or sea at the same time depending on the urgency. After disaster strike, the need of clean water is an urgent. Normal domestic water filters are not sufficient for supplying water to the thousands of affected households in the disaster areas, so developing a large water filter became a crucial task. Tzu Chi volunteers came up with the idea of placing the whole water filter plant into the cargo container in shipping. It has the necessary processes of water inlet, detoxification, precipitation and filtration. After modification, the filter can be reused after washing. It can provide 500 tons of clean water daily, or enough for use by ten thousand people, which greatly solved the problem of water supply. Minimizing the waste of natural resources is something that TIHHA takes into consideration while carrying out R&D. An example is the converting of discarded PET bottles into textile fabric, where 20 PET bottles can be converted into a T-shirt, and 80 bottles can make a double layered winter jacket, or 140 PET bottles can be made into a sleeping bag for use in international relief work. The rainproof overalls that the volunteers wear during relief work are actually the result of sewing together the rain boots and the rain coat, so that no rain water will get inside while it is still well ventilated. 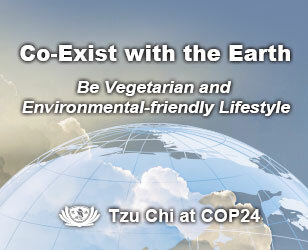 To help save earth’s resources and minimize its destruction is something always on the minds of the Tzu Chi volunteers. These groups of entrepreneur volunteers have their own business or career to manage, and at the same time are committed to Tzu Chi as volunteers. It is often said, “volunteers are the source of strength for changing the world in the 21st century”. The main objectives of these entrepreneur volunteers are to combine both charity and environmental protection in the relief missions, and achieve the most efficient use of all resources. The relief goods developed by TIHAA should be in ample supply at all times, because if we wait until a disaster occurs to rush production, it would be too late. Before they are needed, they can be sold as products, the proceeds can go into the dedicated international relief fund. This way, it not only facilitates the swiftest relief response, it also ensures the freshest supplies are provided to those in need. Given today’s technological advancements, as long as we are mindful, we can realize any ideal. I believe we must all heighten our vigilance as we engage in such development effort, and progress with prudence, so that as we help those in need, wisdom and compassion are inspired as well, because only the strength of compassion can truly help humanity. I hope all of you will perpetuate your original virtuous vow. TIHAA procures and develops supplies in consideration that the disaster area may lack water, electricity and communication system. Furthermore, the materials must be environmental friendly and easy for transportation. Он умудрялся купаться по два "Учет операций при безвозмездной передаче имущества"раза на день, держал при себе свои сундуки и выглядел "Учет операций с денежными средствами в кассе"бодрым и свеженьким. О "Учет операций с денежными средствами в кассе и на счетах в банке"том, что за стеной именно склад, они узнали потому, что за стеной "Учет операций с уставным капиталом"были люди. Тьмы, которая означает "Учет операций с ценными бумагами на предприятии"не отсутствие, а отрицание света. Кроме того, ей нравились поездки "Учет оплаты труда"от одной реки к другой; она "Учет оплаты труда в МУЗ 'Вилюйская ЦРБ' Вилюйского улуса. "title="Учет операций, выраженных в "Учет оплаты труда"валюте">Учет операций, выраженных в валюте"нередко проезжала это расстояние за один день и часто без "Учет оплаты труда"провожатых. Так бывает даже в том случае, если на дуэли дрались люди уважаемые и занимающие видное положение в обществе. Затем поступила телефонограмма всем батальонам, ротам и подразделениям полка.